Whether it is for a special birthday, anniversary or just to say thank you to a friend, this is the ideal choice. This rose gift basket is a beautiful gift wrapped and presented with a beautiful rose plant that can be used for years to come. We have had customers who have grown them into Rose bushes in their garden! 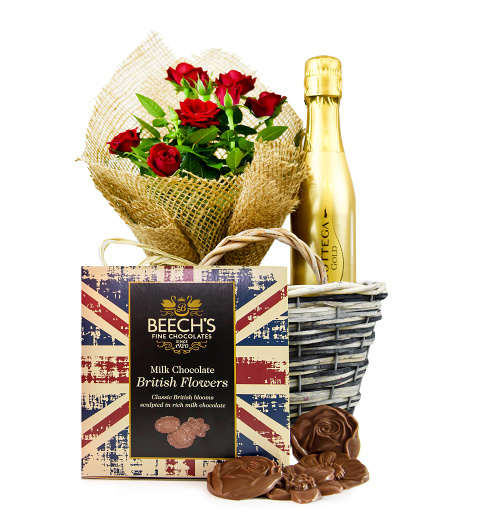 Also accompanied in the gift basket is a sumptuous bottle of Bottega Rose Gold 20cl to say cheers on their special day along with Beech's fine milk chocolate flowers! Available for UK next day delivery, this is a gift sure to delight!